The Dome of the Rock, or Qubbat as-Sakhra in Arabic, was built over the rock at the beginning of the rise of the Islamic empire. 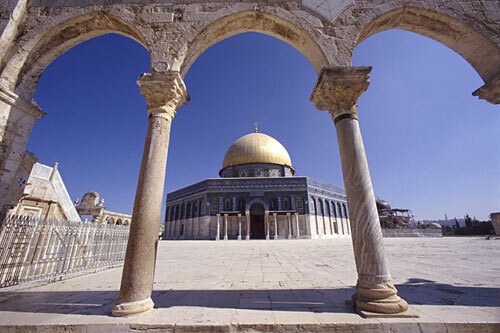 It considered the spot where the prophet Muhammed ended his Night Journey to Jerusalem and ascended to heaven. It is covered inside and outside with colored mosaics and Arabic calligraphy.